At West Lynn we have a different character trait that we highlight every month. For the month of November it is Compassion. I spent some time on google and came across a pretty good lesson perfect for Kindergarten. 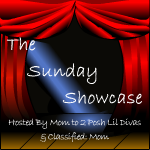 It was based around the book The Brand New Kid by Katie Couric. I am always a bit hesitant reading children’s book by ‘celebrities’ but I was very pleasantly surprised. This is a great book with a great message, written mostly in language that kindergartens can follow and it has a nice rhyme and cadence for a read-aloud. I was fortunate to find the book in our local public library. I started our study last Monday by reading the book to the class. Throughout we discussed how Lazlo was feeling, and then eventually what Ellie did to make him feel better. After finishing I told them that Ellie was showing compassion to Lazlo. We discussed that compassion is caring and helping someone when they have a need, the easiest way for them to understand is to tell them it is trying to help someone feel better when they are sad or upset. At the end of the day I sent a letter home with each student explaining the book to parents and asking them to discuss the concept of compassion at home. Today we reviewed The Brand New Kid and I read them Grady the Goose by Denise Brennan-Nelson. I borrowed this book from my teaching partner and it was perfect on many levels. We are studying migration and today specifically we were looking at the Canada Goose, but in terms of compassion the farmer in the book shows compassion to Grady by freeing her and taking her to her family. 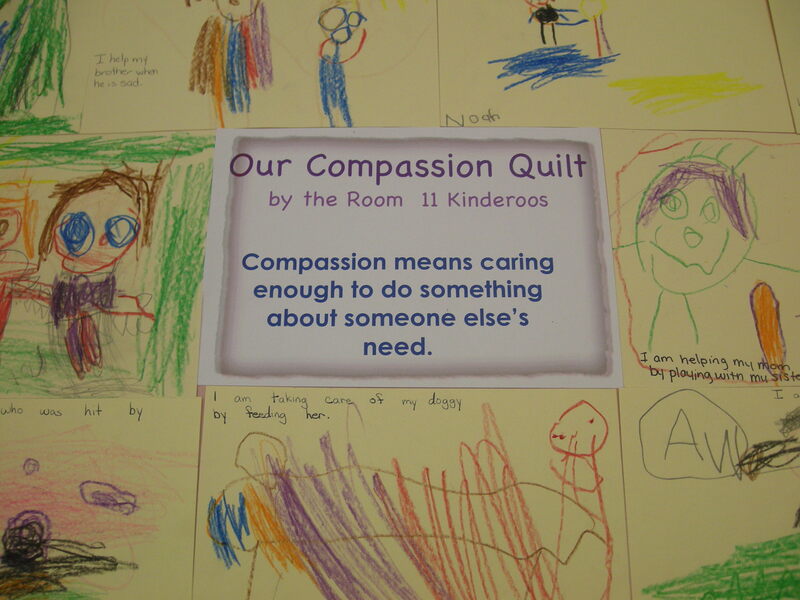 After this I introduced the compassion quilt to them. 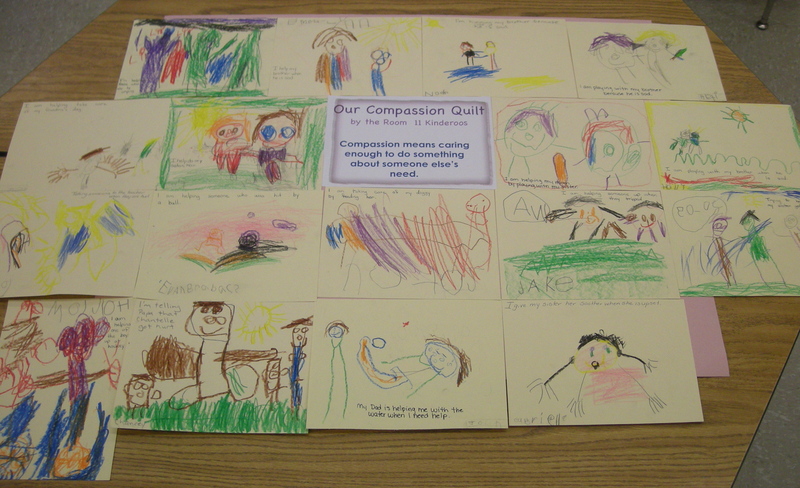 Each student was given a small square of paper and they each had to draw a picture of someone showing compassion. To make sure they knew what they were going to draw I had them tell me before I gave them their paper. This gave me the opportunity to clarify their answers and make sure they understood the concept of compassion. When they were done they had to bring their square to an adult in the room (myself, my EA or one of my volunteers) and we wrote their sentence for them describing their picture. At the end of the day I glued them all together on a large bristol board, and I am VERY happy with how the finished product turned out! Next month is cooperation and I would love any and all suggestions for what I can do with my Kinderoos!